Went to a concert in London. My first journey by train of 2016. 23/2/2016 Leigh-on-Sea to London Fenchurch Street. London Paddington to Bristol Temple Meads via Bath. Bristol Temple Meads to Stapleton Road. Stapleton Road to Severn Beach. Severn Beach to Bristol Temple Meads. Bristol Temple Meads to Cardiff Central. Cardiff Central to Cardiff Queen Street. Went to both Bristol and Cardiff on business with a quick detour via Severn Beach. No problems and a nice journey from London to Bristol. Noticed that the overhead gantries are starting to be built along the Western main line as far as Didcot at the moment. It will be such a shame losing the clear views of trains in the western part of England and South Wales when they are eventually built. 24/2/2016 Cardiff Queen Street to Cardiff Bay and return. Cardiff Queen Street to Cardiff Central. 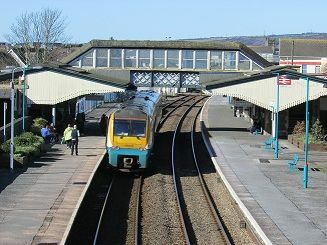 Cardiff Central to Swansea. Swansea to Llanelli. Llanelli to Fishguard Harbour. Fishguard Harbour to Cardiff Central. Cardiff Central to London Paddington. London Fenchurch Street to eigh-on-Sea. Continuing my visit to South Wales I managed to get the branch to Cardiff Bay as well as a visit to Fishguard Harbour going on the Carmarthen avoiding curve outward. In fact I travelled right across Wales and England from west coast to east coast in around six hours today. Lovely sunny weather for February. The train to and from Fishguard was virtually empty though. Thamslink Trains at Blackfriars station. 5/3/2016 Leigh-on-Sea to London Fenchurch Street and return. London Blackfriars to Luton Airport Parkway. Luton Airport Parkway to Elstree & Boreham Wood. Boreham Wood to Farringdon. Went to see Boreham Wood FC play Barrow in the National League after a quick visit to Luton Airport for photos. It was actually snowing at Luton Airport Parkway station when I left for Boreham Wood, but it soon stopped the further south the train went. 19/3/2016 Leigh-on-Sea to London Liverpool Street and return. London Liverpool Street to Cambridge. Cambridge to Peterborough. Peterborough to London Kings Cross. Went up to Peterborough today. Decided to go via Cambridge and March as it was a route I hadn't been on for several years. 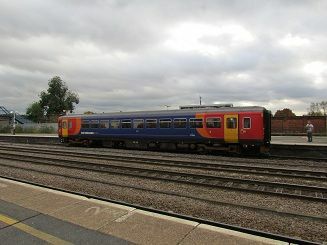 The train from Liverpool Street was a Stanstead Express with plenty of room, whilst the train from Cambridge to Peterborough was a X Country with just three carriages and absolutely chock a block. 8/4/2016 Leigh-on-Sea to West Ham and return. Went to the 02 today where I took part in a walk to the roof of the 02 and back. Very interesting! 14/4/2016 Leigh-on-Sea to London Fenchurch Street and return. Went up to London for a business meeting today. 16/4/2016 Leigh-on-Sea to London Fenchurch Street. London Victoria to Fareham via Horsham. Fareham to Portsmouth & Southsea. Bedhampton to London Waterloo. West Ham to Leigh-on-Sea. Went for a day out to the South coast today. Was meant to visit both Portsmouth and Southampton as well as the Eastleigh to Fareham line, but when I got to London Victoria there was no sign of my Southern train. There had been a fatality at East Croydon earlier in the day so all the trains had got delayed. I was meant to get the 11.37 to Southampton via Horsham, but it didn't arrive until just after midday. We left Victoria at about ten past twelve so we're half an hour late all journey. By the time we arrived at Havant the guard announce that the train would be terminating at Fareham and passengers for Southampton should wait for another train there. This meant my schedule was all up the creek so I had to abandon going into Southampton and Eastleigh. Instead I got a train back to Portsmouth and then made my way to Bedhampton where I was able to get a through train to Waterloo. In the end I arrived home about an hour earlier than planned. 5/6/2016 - Rayleigh to Stratford. Startford to London Liverpool Street. London Liverpool Street to Bethnal Green and return. London Liverpool Street to Southend Victoria. Southend Victoria to Rayleigh. Went up to London to take some photos and to cover the whole of the line to Southend Victoria. Went to Oxford for the day to attend a reunion event. Luckily the problems that had affected Paddington a week ago had long been sorted, though the train to Oxford was pretty full, mainly with tourists. I then left Oxford on the 17.40 Cross Country train from Bournemouth to Manchester Piccadilly, which was about ten minutes late due to a "trespass" on the line somewhere. After checking into my hotel in Coventry I went back to the station to get a train to Birmingham International where I attended a concert at the NEC. Afterwards the station was very crowded with people trying to get back into Birmingham and not all of them were able to get on the London Midland train. It seems starnge that when there is an event on at such a big venue, they don't lay on extra trains. My London Midlands train back to Coventry was also crowded with standing room only, but most people got off at Coventry. 26/6/2016 - Coventry to Birmingham New Street. Birmingham Moor Street to London Marylebone. London Liverpool Street to Leigh-on-Sea. Coming home I decided to come home on a Chiltern Lines train as opposed to a Virgin West Coast train. It was a good decsion as the 11.55 happened to be loco hauled and had excellent quality coaches. There was a business class coach, as opposed to a 1st Class coach and I could have gone in that for a £10 upgrade, but I stayed in my ordinary class carraige, which was one of the best upholstered carriage I have ever been in. Also I had a table seat all to myself as far as High Wycombe, which had two sockets by the table. My carriage was quite empty as we left Birmingham, but was pretty full by the time we arrived at Marylebone. All in all Chiltern Railways are one of my favourite train operators and the journey today was a pleasant and rewarding one. 9/7/2016 Leigh-on-Sea to West Ham and return. London Waterloo to Reading via Richmond. Reading to Basingstoke. Basingstoke to Woking. Woking to Surbiton. Surbiton to Wilmbledon. Wimbledon to Hampton Wick. Hampton Wick to Twickenham. Twickenham to London Waterloo. Went to Reading via Richmond as hadn't been all the way on this line for ten years. Plus the Reading to Basingstoke line I hadn't been on since the 1970's! Had a chance to look round the newly refurbished Reading station. Whilst it all looks very neat and new there was one thing missing....There didn't seem to be hardly any passengers! Maybe because it's so much bigger with 12 platforms, they are more spread out, it was just a quiet period whilst I was there. I missed seeing one of the newly liveried GWR units in green which was a pity. 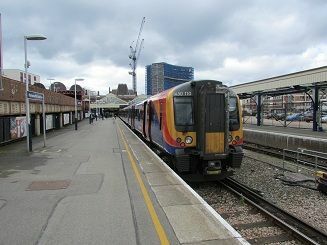 Coming back via Basingstoke, I wnated to get a train on the New Malden to Twickenham branch. In the end it was easier to go to Wimbledon and get a train there rather than changing at Surbiton and then New Maldon. 23/7/2016 Leigh-on-Sea to Fenchurch Street and return. London Bridge to Three Bridges. Three Bridges to Haywards Heath. Haywards Heath to Lewes. Lewes to Brighton. Brighton to London Blackfriars. 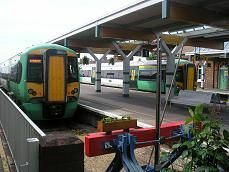 A day when I experienced some of the problems passengers are having to face with the Southern Trains industrial dispute. The plan was for myself and a friend to go down to Brighton and then get a train to Lewes where we would catch a bus to go on the Lavender Line. What happened was that we picked up a Southern Trains train at London Bridge going south, which was fairly empty. 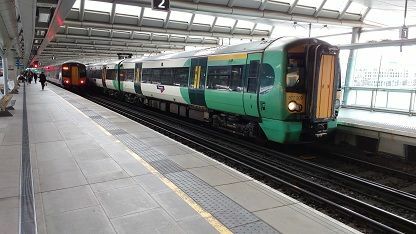 As it was going to Portsmouth we decided to change at East Croydon rather than Three Bridges. A big mistake! With lack of trains and many more people than normal travelling down to Brighton on a summer saturday, we found most trains packed to the rafters. We got our first train as far as Three Bridges and then changed to a following train which which just as crowded. In the end we changed plans and went to Lewes direct from Haywards Heath. When we got to Lewes we waited for a bus. One eventually came, but it didn't go direct into the village of Islfield where the Lavender Line is situated. It would have meant a walk of over a mile in boiling hot weather. We tried waiting for the next scheduled one to Islfield but it never came, so we gave up and went back to Lewes station, where we eventually caught a stopping train into Brighton, after two had been cancelled. After a brief walk round Brighton we got a Thameslink train back to London Blackfriars, which was about three quarters full, but we got a seat OK. 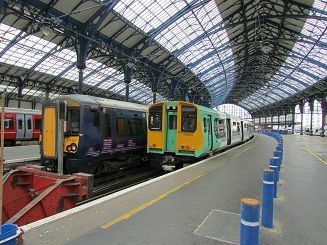 So not an enjoyable day as hoped for and we suggest that the Lavender Line provide a minibus service for those coming by train to Lewes if they want to attract more custom! 27/7/2016 Leigh-on-Sea to Fenchurch Street and return. London Euston to Crewe. Crewe to Newport. Newport to London Paddington. Had to go up to Crewe with my work. Going up was very quick on Virgin, but coming back I decided to go along the Marches Line to Newport and then back accross to London. The problem with the Arriva Trains train I was on was that it only had two carriages and was very full. So I ended up standing from Crewe to Shrewsbury. I got a seat then but it was facing backwards and it wasn't until I got to Ludlow that I got a forward facing seat. I found out from someone who had started the journey at Manchester Piccadilly that the previous train had been cancelled and that was why it was so full. Anyway the journey south from Shrewsbury is a very picturesque one and one of the better cross country journeys in terms of scenery. 2/8/2016 - Bishops Lydeard to Minehead and return. Away on hoilday in Somerset, so went on a round trip to Minehead and back on the West Somerset Railway, the longest preserved railway line in Britain. I had been on this railway about ten years ago, so it was interesting to see what had changed. The journey was very enjoyable and there was plenty to see and do in Minehead. My only gripe was that the railway doesn't seem to have expolited the joining of the line through to Taunton. They could at least extend trains to Norton Fitzwarren where there is a platform/station. When we arrived the car park was full and we were directed to the staff car park, which also was full, so a move further east might help ease congestion. I know it's a Network Rail problem, but if the Spa Valley railway can take trains through to a national rail station, why can't the West Somerset? 16/8/2016 - Wroxham to Aylsham and return. Away again and decided to take a trip on the Bure Valley railway. 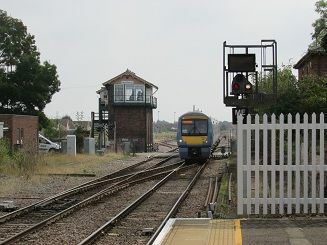 It was originally a normal guage railway in its British Railway days, but was preserved as A narrow guiage railway, rather like the Romney, Hythe and Dymchurch Railway. I thought it was OK, but not half as interesting as it would have been had it been preserved as it originally was. 25/8/2016 - March to Nuneaton. Nuneaton to Leicester. Leicester to Peterborough. Peterborough to March. Whilst my wife was visiting friends in Kings Lynn, I drove to March and caught a Cross Country train across Nuneaton. I hadn't been on some of this route since the 1970's. Luckily the three Cross Country trains I travelled on had plenty of seats, unlike the one I cuaght a few months ago from Cambridge to Peterborough - well it was a saturday then. 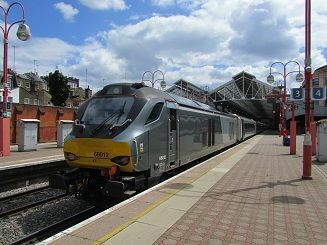 The route between Peterborough and Leicester is like going back in time with the three stations of Stamford, Oakham and Melton Mowbray all having their particular characteristics. 3/9/2016 - Leigh-on-Sea to Fenchurch Street. London Bridge to Tonbridge. Tonbridge to Redhill. Redhill to Gatwick Airport. Gatwick Airport to Haywards Heath. Haywards Heath to Brighton. Brighton to West Worthing. West Worthing to Littlehampton. Littlehampton to Ford. Ford to East Croydon. East Croydon to London Bridge. Compared to my previous journey down the Brighton main line in July, this was much easier and better, with non of the over crowding and delays I had suffered then. I had a Southern Day Save ticket (cost £21) which meant I could go anywhere on Southern Railways. I started my day with an easy journey down to Tonbridge where I went across to Redhill on one of the straightest pieces of railway line in the country. Then after a stop at Haywards Heath to see an old school friend, I went on the Coastway West line to Littlehampton. I was going to chnage at Horsham on the way back and get a train on the Mole Valley Line but decided to leave that for another day. Went to see West Ham play Accrington Stanley in the EFL Cup at the London Stadium. All credit to C2c who had laid on extra trains after the match from West Ham, the first time I had come across a train starting from WestbHam. 7/10/2016 - Leigh-on-Sea to London Fenchurch Street. London Euston to Liverpool Lime Street. Liverpool Lime Street to Warrington Central. Warrington Central to Manchester Piccadilly. Manchester Piccadilly to Crewe. Crewe to Chester. Chester to Bache. Went away to the North west for the weekend and managed to go on several railway lines during my time up there. Journey to Liverpool was fine and on time. Went accross from Liverpool to Manchester with a stop off in Warrington. My journey from Manchester to Crewe on a Virgin service was not so enjoybale. I did get a seat but the train was full even before it left Manchester and worse after stopping at Stockport. It did ease off at Macclesfield but was still standing room only when I got off at Crewe. 8/10/2016 - Bache to Chester. Chester to Holyhead and return. Chester to Birkenhead Central. In the morning made a pleasant journey to Holyhead and back from Chester. Always a lovely sea view after Llandudno Junction, though I do find crossing Anglesey is a bot monotonous after a while. 9/10/2016 - Birkenhead Central to Chester. Chester to Wolverhampton via Shrewsbury. Wolverhampton to Stafford. Stafford to Birmingham New Street. Birmingham New Street to Nuneaton. Nuneaton to London Euston via Northampton. London Liverpool Street to to Leigh-on-Sea via Stratford and Tilbury. Came back to Essex today with a detour via the West Midlands on a West Midlands Day Ranger ticket which took me from Gobowen all the way across Birmingham to Northampton for just £25.00. The journey between Chester and Wrexham I hadn't done since the 1970's and I'm glad to see see that they are doubling this section once again. What madness to single it in the first place. Taking rather a long time to do it though. After Wrexham the train was full of Wales fans going down to Cardiff for the International football match. They all got off at Shrewsbury but it was still full to Wolverhampton, where I did a quick detour to Stafford and back. Coming back from Stafford on a Cross Country train once again it was packed with standing room only all the way to Birminhgam. Then my next train to Nuneaton - also a Cross Country Trian- was alos packed. Isn't it about time that Cross Country started putting a few extra carriages on their trains at weekends? Three or four carriages aren't enough at weekends, which are often busier than in the week. Went up to Nottingham and Lincoln for the day to cover some track I hadn't been on for some time. The plan was to go up Derby first and then go east via Nottingham and Newark to Lincoln. Then come back down to London via Sleaford and Essex. I did manage to do all of it apart from the Derby leg of the journey. This was becasue there had been a fatality just north of Kettering earlier in the day and most trains were cancelled, including mine - the 10.26 to Sheffield from St. Pancras. I could have gone up the East Coast Main line to Peterborough and then across to Leicester and then resumed my journey, but I wouldn't have been able to fit it all in to my schedule. So I decided to chance it at St Pancras hoping that things might have started to return to normal. When I got there I could see on the board that my train was cancelled but the 10.15 to Nottingham was running as scheduled. I decided to try and get on this train and was actually waved through the gates without having to show my ticket. The first carriage I went through was full, but walking through a few carriages there was plenty of room further up, so I sat there waiting for the guard to come and check my tickets, but she never showed. I was going to get off at East Midlands Parkway and change for a train to Derby, but there wouldn't be a train for another hour to Derby, so I stayed on to Notttingham and with my extra time broke my journey in Newark for half an hour before going onto Lincoln. My train out of Lincoln was just a single carriage "Bubble Car" and as you would expect was packed with standing room only, as far as Sleaford. After that there was more room, but again two carriages on this line during the half term break wouldnt go amiss. 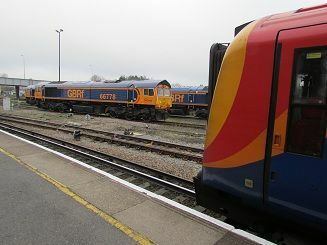 GBrF Class 66's stabled at Eastleigh. 11/11/2016 Leigh-on-Sea to London Fenchurch Street and return. Went up to London to see John Lees Barclay James Harvest in concert at the Cadogan Hall. 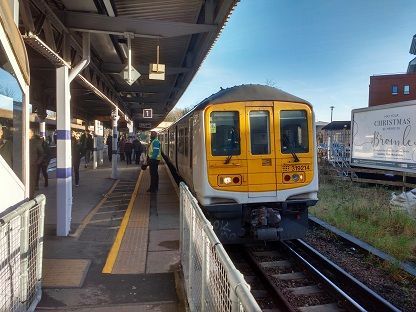 18/11/2016 Leigh-on-Sea to London Fenchurch Street and return. Went up to London to see Stray in concert at the Borderline Club. 26/11/2016 Leigh-on-Sea to London Fenchurch Street. London Waterloo to Southampton Airport Parkway. Southampton Airport Parkway to Romsey via Southampton Central. Romsey to Eastleigh via Chadlers Ford. Eastleigh to Fareham. Fareham to Burlesdon. Burlesdon to St Denys. St Denys to Southampton Airport Parkway. Southampton Airport Parkway to London Waterloo. London Fenchurch Street to Leigh-on-Sea. Went to the Southampton area to travel on some lines I hadn't been to for a while and to see some friends who live down there. 3/12/2016 - Marks Tey to Colchester Town. Colchester Town to Colchester. Colchester to Manningtree and return. Colchster to Marks Tey. Drove uip to North Essex and then went round a few stations in the Colchster area taking photos for my next railway book. 11/12/2016 - Leigh-on-Sea to London Fenchurch Street and return. London Victoria to Swanley via Catford. Swanley to Bromley South. Bromley South to London Victoria via Herne Hill. Went up to London and out to Swanley for the afternnon. Went on a South East train from Victoria which was going all the way to Margate. Interesting to see that it went via Catford and not Herne Hill for this route, non-stop as far as Bromly South - possobly because it was a sunday. Also intersting to see a lack of Southern Trains at Victoria making it almost like a ghost station in parts. Went out to Aylesbury for the day, a place I hadn't been to by rail for several years. Went up to London to meet some friends for lunch.